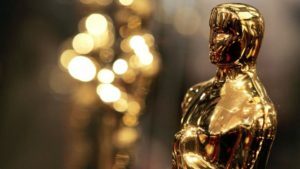 Oscars 2018: Which flick will win Best Pic? Curious to know which movie will win this year’s top prize at the 90th Academy Awards? Me, too! Here’s a quick rundown of each nominee and my thoughts on what each has to offer in its quest to take Oscar gold. What’s it about? During World War II allied soldiers are surrounded by the German Army when an unconventional rescue mission is set in motion. What makes it a contender? Umm, its director is a freakin’ genius. I’m not big on war movies, but Christopher Nolan is the reason I wanted to see this. Nolan easily is one of the most cerebral filmmakers in recent memory, and he once again amazes with gritty and visceral battle sequences, and that disjointed timeline of air, land, and sea events that is so trademark Nolan and the only way this story could be told. There’s very little dialogue here, but that’s fine; the action says everything. Will it win? It probably won’t win Best Picture, but I expect “Dunkirk” to clean up the technical awards. What’s it about? An understandably pissed off mother rents three billboards on the edge of town to keep attention on solving her daughter’s brutal murder after local law enforcement seems to have dropped the ball. What makes it a contender? Its sharp-tongued, unfiltered dialogue; the heavy and emotional subject matter; and stand-out performances from Frances McDormand (who will, oh by the way, win for Best Actress), Woody Harrelson as the town’s beloved Chief Willoughby, and Sam Rockwell (a lock to win his first Oscar, for Supporting Actor) as the dopey deputy with “slightly racist leanings” whose transformation is something to behold. Will it win? Probably, and I sure hope so. This is my favorite of the nominees, and I would love to see “Three Billboards” take home the win. What’s it about? Wacky coming-of-age tale that follows Christine “Lady Bird” McPherson as she navigates high school ridiculousness with best bud Julie “Jules” Steffans, examines relationships with boys, expresses herself in artistic ways, and desperately tries to distance herself from both Sacramento and her overbearing mother. What makes it a contender? It takes a realistic and relatable look at the mother-daughter dynamic. Director Greta Gerwig expertly balances the curiosities and naivete of youth against the jaded wisdom and unfulfilled ambition of adulthood. Saoirse (pronounced “Seer-sha” – you’re welcome) Ronan and Laurie Metcalf are a joy to watch, even when (read: especially when) they’re bickering. Metcalf would be nabbing the Supporting Actress Oscar for this role if not for Allison Janney (“I, Tonya”), but Metcalf’s role still is worthy of gold. Will it win? I doubt it, but that’s not to say that it isn’t deserving of the nomination or the win. What’s it about? A wonderfully weird Cold War-era fantasy about a mute maintenance worker in a government laboratory and the unconditional bond she forms with a top-secret aquatic being. What makes it a contender? It’s quirky and freakishly gorgeous, and the story of forbidden longing goes far deeper than what’s on its surface. It’s acceptance – and feeling accepted. And the performances from Sally Hawkins (a Best Actress nominee) and Richard Jenkins (up for Supporting Actor) are so achingly bold you’ll be completely immersed in the narrative. Also, is it just me or does Michael Shannon get creepier with each role? Will it win? This is a tough one; Best Picture and Best Director used to go hand-in-hand, but lately that hasn’t seem to be the case. I don’t think “The Shape of Water” will win Best Picture, but I do think Guillermo del Toro will win Best Director. His vision here is extraordinary! What’s it about? The First Amendment… aaaand gender competencies with regard to leadership roles takes center stage as a determined newspaper publisher – a woman, gasp! – risks her business and its reputation in an attempt to expose a decades-long government cover-up because divulging the information is in the best interest of the people. What makes it a contender? Three words: Streep, Hanks, Spielberg. They’re historically the best at what they do, and “The Post” masterfully depicts the importance of journalism at a time when – ironically, but that’s no accident – its very relevance is habitually being questioned. Will it win? No, but I think its message is head loud and clear, and that’s the real victory here. What’s it about? Newly appointed Prime Minister Winston Churchill takes office at a most inopportune time: when the fate of World War II-era Western Europe is dependent on his decision to continue fighting or negotiate peace talks with Adolf Hitler. What makes it a contender? An undeniably incredible performance from an unrecognizable – except for those tell-tale eyes – Gary Oldman; it’s the major source of promise in this seemingly hopeless scenario. As Churchill, Oldman is loud and intense and a little bit frightening: “YOU CANNOT REASON WITH A TIGER WHEN YOUR HEAD IS IN ITS MOUTH!” (This is in all caps because that’s how I heard it). Will it win? I don’t think so. But Oldman almost surely will win his first Oscar (shocking, considering his talent and extensive filmography) for Best Actor; all eyes are on the man with those patented peepers. What’s it about? The odd and sometimes unsettling story of a 1950s eccentric dressmaker and the young woman who inspires him and affects his routine life. What makes it a contender? Daniel Day-Lewis’s method acting is downright magnetic and is matched here by knockout performances by Vicki Krieps and Lesley Manville – the lighting effectively expressing the respective softness and harshness of each of their personalities. The imagery is stunning, and this story will have you reassessing everything even after the credits roll. Will it win? No, but look for “Phantom Thread” to likely score costuming and visual awards. What’s it about? Despite half-joking warning from his best friend Rod (Lil Rey Howery), Chris (Daniel Kaluuya) and girlfriend Rose (Allison Williams) spend the weekend with her parents, whom Chris is meeting for the first time – “Do they know I’m black?” he wonders. What makes it a contender? It’s amazing! The story in this psychological thriller – with a touch of horror – is MESSED. UP. But that’s a compliment. It’s well thought-out and hypnotically (heh) executed by writer/director Jordan Peele. The racial issues are both obvious and subtle, and the little hints along the way culminate in the most shocking “holy sh*t” moment. “Get Out” is wickedly innovative and so disturbing, and Kaluuya is outstanding. Will it win? I don’t think it will win, but I wouldn’t be surprised. This one totally blew my mind. What’s it about? Seventeen year-old Elio (Timothee Chalamet) develops a relationship with his father’s visiting research assistant Oliver (Armie Hammer) in 1980s Italy. What makes it a contender? The backdrop is clearly breathtaking, but two other aspects of “Call Me by Your Name” stand out even more so than the Italian countryside. The deep, raw feelings that are discovered and displayed bring a tangible quality to what it’s like to experience love. There’s an unmatched realness to these emotions that are wholly exhilarating and agonizing. And Chalamet? Get outta here; he’s INCREDIBLE – like, shake-your-head, jaw-dropping, mind-blowing incredible. This film ends with one of the most profound speeches I’ve ever heard as well as one of the most intense gazes I’ve ever seen. And if I wasn’t already a puddle at that point, there’s a dedication to Bill Paxton on the end credits. My heart! Will it win? Based on the sensitivity and emotional weight, “Call Me by Your Name” very well might win. It was one of my favorites, so I wouldn’t be upset. Chalamet is nominated for Best Actor, and he absolutely deserves to win; if you’ve seen this flick, I don’t even have to explain why. But we’ll see if he can best Gary Oldman for the statue. There you have it. Watch the 90th Academy Awards on March 4 to see if your favorites take home Oscar gold. You have just enjoyed the insights of Movie Addict Mel, a cinema dork and conversational writer. Follow her on Twitter @movieaddictmel, and “like” her Facebook page www.facebook.com/movieaddictmel. You also can email her at movieaddictmel@outlook.com. This entry was posted in Uncategorized by Melissa King. Bookmark the permalink. enjoyed your comments very much, wish I’d seen the movies.